Emperor Ankō (安康天皇, Ankō-tennō) was the 20th emperor of Japan, according to the traditional order of succession. Historians consider details about the life of Emperor Ankō to be possibly legendary, but probable. The name Ankō-tennō was created for him posthumously by later generations. No certain dates can be assigned to this emperor's life or reign. The conventionally accepted names and sequence of the early emperors were not to be confirmed as "traditional" until the reign of Emperor Kammu, who was the 50th monarch of the Yamato dynasty. The Kojiki and Nihon Shoki record that Ankō was the second son of Emperor Ingyō. Some accounts report that Ankō murdered his own father. Very little is known about the events of Ankō's life and reign. Only limited information is available for study prior to the reign of the 29th monarch, Emperor Kimmei. 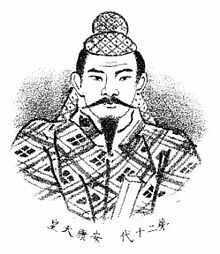 462: According to Chinese records, a delegation from the Japanese monarch was received in the court of the southern Sung Dynasty. The "king" mentioned in these documents probably would have been Emperor Ankō. The designated Imperial mausoleum (misasagi) of Emperor Ankō in Nara. It is believed that Ankō was murdered in the third year of his reign. This emperor's official name after his death (his posthumous name) was regularized many centuries after the lifetime which was ascribed to Ankō. According to the Imperial Household Agency, the emperor's final resting place is in an earthen tumulus (kofun). This emperor is venerated at a memorial Shinto shrine (misasagi) which is associated with the burial mound. ↑ 1.0 1.1 Imperial Household Agency (Kunaichō), 安康天皇 (20); retrieved 2011-10-16. ↑ Titsingh, Isaac. (1834). Annales des empereurs du japon, pp. 26-27; Varley, Paul. (1980). Jinnō Shōtōki, p. 113; Nussbaum, Louis-Frédéric et al. (2002). "Traditional order of Tennō" in Japan encyclopedia, pp. 962-963. ↑ Kelly, Charles F. "Kofun Culture," Japanese Archaeology. April 27, 2009; retrieved 2011-10-16. ↑ Martin, Peter. (1997). The Chrysanthemum Throne, p. 31. ↑ Nussbaum, Louis Frédéric et al. (2005). "Miyatsuko" in Japan Encyclopedia, p. 651. ↑ Aston, William. (1998). Nihongi, Vol. 1, pp. 328-333. ↑ Edwards, Walter. "Contested Access: The Imperial Tombs in the Postwar Period," Journal of Japanese Studies, Vol. 26, No. 2 (Summer, 2000), pp. 371-392; retrieved 2011-10-16. This page was last changed on 12 August 2018, at 06:58.